This after sun spray is great at soothing sun damaged skin! 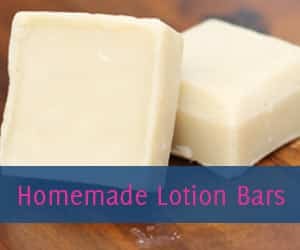 Not only is it effective, it’s also easy just like this Homemade Sunburn Relief Cream. Most of us love a little fun in the sun, especially after a long winter, but the truth is, sun exposure isn’t necessarily good for us. In the long run, sun exposure can leave you with age spots, skin discoloration, and wrinkles! According to WebMD, “Sun exposure causes most of the skin changes that we think of as a normal part of aging. Over time, the sun’s ultraviolet (UV) light damages the fibers in the skin called elastin. When these fibers break down, the skin begins to sag, stretch, and lose its ability to go back into place after stretching. The skin also bruises and tears more easily — taking longer to heal. Yikes! And it isn’t just the outside you have to be concerned about. Sun exposure can also lead to skin cancer! The after sun spray recipe I’m about to share with you is great for soothing sun damaged skin including restoring moisture, preventing the signs of aging, and healing damage! Psst! Avoiding prolonged sun exposure doesn’t meant giving up your tan. You can achieve that healthy, sun-kissed glow without the sun or tanning beds! Just try this homemade self tanner. While this after sun spray is great for giving your skin a little TLC after a day in the great outdoors, the best thing you can do is protect your skin before venturing out. You can protect your skin with clothing such as a wide brimmed hat or long sleeves, but another great option is sunscreen. Personally, I’m not a huge fan of slathering myself with chemicals and artificial ingredients. I’m even less of of a fan of putting those things on my little man, so I usually opt for a homemade sunscreen or even sunscreen lotion bars. Regardless of what sunscreen you decide to go with, keep in mind that sunscreen must be reapplied. That’s right… you can’t just dab it on once a day and be good to go. Typically, sunscreen needs to be reapplied every two hours! Lavender essential oil, which has antiseptic, anti-bacterial, and anti-inflammatory properties. 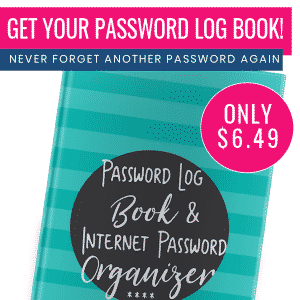 Plus, it has aromatherapy properties that may help you (and the kiddos!) unwind after a hectic day outside. Helichrysum essential oil, which has anti-inflammatory properties and contains diketones, which can help reduce the appearance of age spots and skin discoloration. There are also ingredients in this after sun spray that can sooth sunburn, including witch hazel and peppermint essential oil. However, if you get really sunburnt, you may want to use this after sun spray AND this homemade sunburn relief cream. 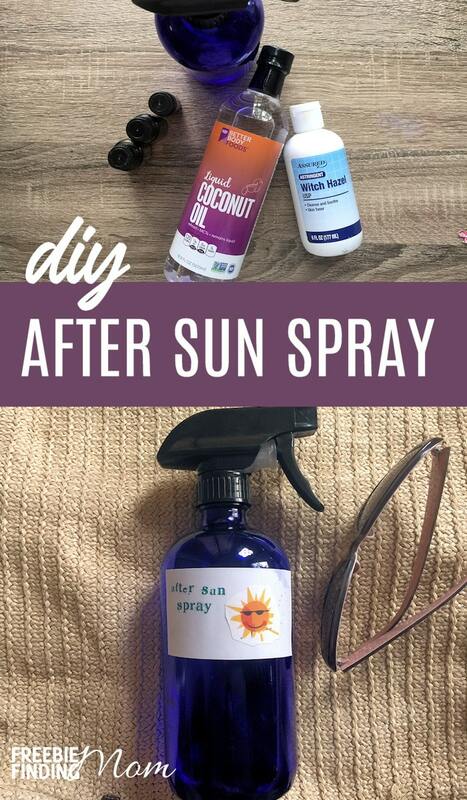 In addition to being good for your skin and effective at helping to relieve the pain associated with sunburn, this after sun spray is super easy to make. Spoiler alert: You just add all the ingredients to a container and combine. See? What did I tell you? You can make a batch of this after sun spray in less than five minutes. Go ahead, give it a try. **If possible, opt for a tinted glass spray bottle for your after sun spray. 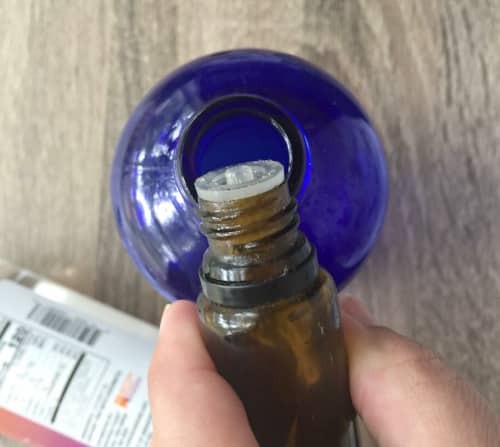 Overtime, essential oils can eat through plastic and a clear container will likely expose essential oils to more light causing them to break down faster. 1. Add all ingredients to the glass spray bottle. 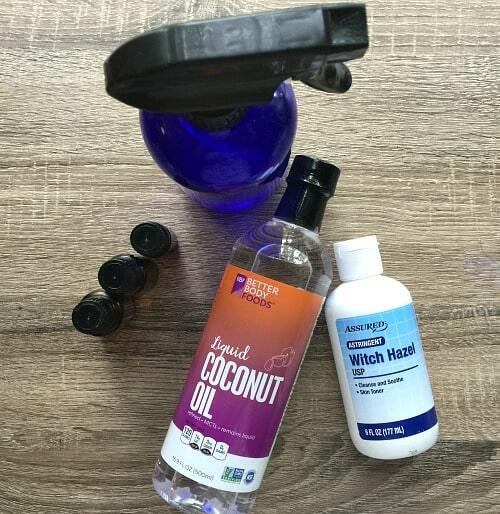 Tip: Keep things tidy by using a funnel to add the coconut oil and witch hazel. 2. Shake well to combine. 3. 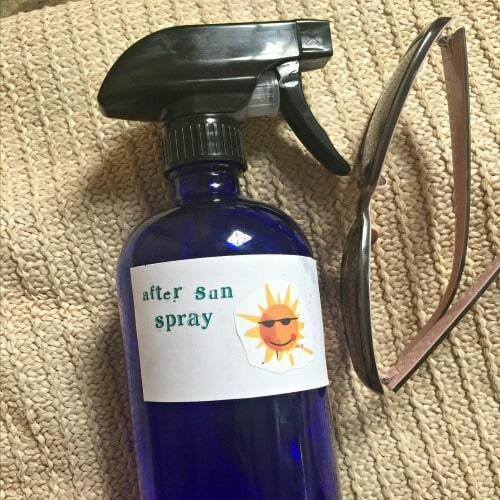 Add a printed or handwritten label to your after sun spray. Tip: Keep this after sun spray in the refrigerator for a really cool treat! 2. Spritz after sun spray all over skin. Tip: Be liberal with it! 3. Allow after sun spray to dry before putting on clothing. This after sun spray is safe to use several times a day. 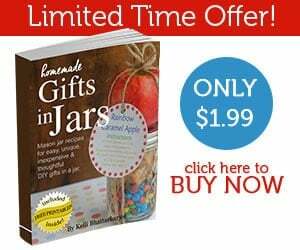 Looking for more ways to remove harmful chemicals from your daily routines? 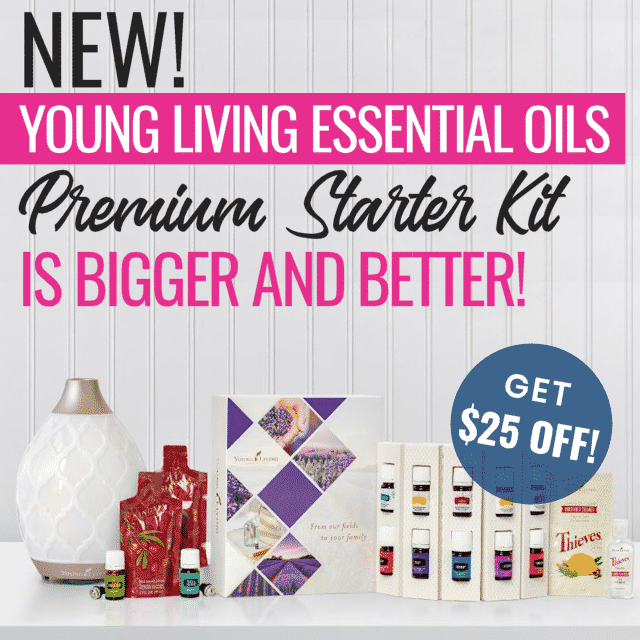 Opt for essential oils! 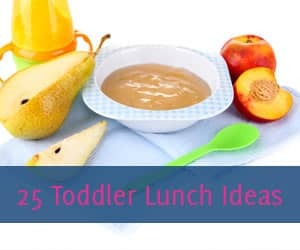 Follow Freebie Finding Mom’s DIY Fun and Essential Oil Recipes Pinterest board for more easy and effective all natural recipes! WOW! who would of thought that it was that easy to make this, I won’t try it now but next summer I will.